How are we doing today? My life's been extra hectic lately, with the huge move just around the corner and everything else, and I've been struggling to keep everything organized. I get a lot of requests from all of you lovely people, and I love them all. I also want to make sure I will get to make them all, and that none of them will get buried under the new ones that continue to pour in. That is why, I decided to make this MASTER LIST of design requests. It is for you and it is for me, too. 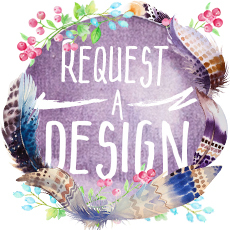 From now on, whenever you'd like to request a design, you no longer have to chase me around the internet, DM me on Instagram or Twitter, or send me an email - I seriously love all of our interactions, but I'm worried that it's a bit inefficient and that I accidentally overlook requests this way. I want to make sure that all of them will be done, and this request form will hopefully help achieve that! Please note: Starting May 16th through June 10th I will be in the process of moving across the country and settling down in New Mexico, so I will not be able to work on any new designs then. I will go through all of them after we touch down and unpack, though, and they will be done on the "first come first serve" basis.